IT WAS IN THE SUMMER of ’64 when a couple of DJs from Tacoma, Washington’s KTNT radio station began hauling a car-load of broadcasting gear around to various remote teen-dance venues in town and their weekly Teen Time program made its on-air debut. Every Friday night (10:35 p.m.—11:00 p.m.) for two years Teen Time featured live performances by energetic young local bands including the Regents, Galaxies, Accents, and Sonics. These recently unearthed recordings of the Sonics’ Teen Time sets from the Red Carpet teen club (5212 South Tacoma Way) and the Tacoma Sports Arena (South 38th and South Tacoma Way) are a treasure. In addition to an explosive early blast through the Sonics’ own soon-to-be radio hit, “The Witch,” we are also treated to two sets of songs that reveal how a regional sound can be sparked when a cluster of bands begin emulating each other. The Pacific Northwest’s early rock ‘n’ roll scene was shaped in part by the fact that the first pioneering bands often had some of their tunes – or even entire set-lists –copied by impressionable up-&-coming bands. In Tacoma, the band to emulate was the Wailers, a combo who first rocked the world back in ‘59 with their international hit record, “Tall Cool One.” The commercial success of that debut disc swept the teenaged band from their hometown of Tacoma, Washington to a big-time tour of major East Coast markets and their hit also won fans in distant lands ranging from England to Germany, Canada to South Africa. Meanwhile, back in their hometown area, the Wailers’ influence was so strong that a legion of newer bands – including the Ventures, Paul Revere & the Raiders, the Kingsmen, Don & the Goodtimes, and the Sonics – all learned much by studying their performances and recordings, and along the way the original “Northwest Sound” was forged. Indeed, members of the Sonics practically learned their instruments by playing along with “Tall Cool One” and the Wailers’ other early discs – but as the Teen Time sessions show, the Sonics also came to admire some of the best tunes featured by other groups around the region. So, in the two broadcast sets documented here we have a number of songs associated with other Northwest bands including the Viceroys’ “Goin’ Back To Granny’s,” the Dynamics' live favorite “Busybody,” and “Night Train,” a tune that many of the era’s bands dug, and that Paul Revere & the Raiders even used as the b-side to their 1963 “Louie Louie” 45. But just as the Sonics had been directly inspired by the Wailers, that pattern of influence repeated itself once again when even newer bands began padding their repertoires with signature Sonics songs – and that is precisely how the Master Tape for this new album came into existence. As it happened, a 15-year old Seattle bassist named Doug Paterson spent many a Friday night with his ear glued to the radio and a 4-track Ampex tape deck cued up to record the live broadcasts of local combos – all in order to bring new tunes to his garage band, Consolidated Roq. What Paterson couldn’t have known at the time was that the Sonics were a band that would transcend their era and continue to hold sway in the hearts of savvy rock fans around the globe all these decades later. Miraculously he managed to hang onto his tape archives and this remarkable recording represents the first vintage live recordings of the Sonics to publicly surface in over two decades. 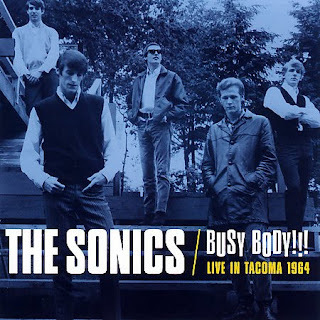 Although the sound quality here is somewhat compromised due to the circumstances surrounding its creation – a live AM radio broadcast captured on reel-to-reel tape some forty years ago – having this rare chance to listen to the band in their early prime is to once again revel in awe of the raw power of the Sonics.